Everyone knows that Valentine’s Day is an extremely important day, and there is no better way to show your loved one how much you care than with our great range of gifts at Ellon Flowers. We pride ourselves on providing excellent customer service and a wide range of gifts. 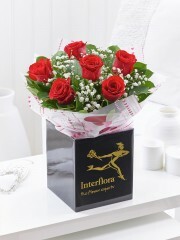 Ellon florists can guarantee that within our range of Valentines gifts there is something to suit all tastes and budgets. Flowers have and always will be a fantastic romantic gift, so choosing Flowers Ellon is the perfect step to finding a timeless and meaningful Valentines gift. We can offer same day delivery if ordered before 3pm, which ensures that your gift can reach that special someone in time for Valentine’s Day. Ellon flower delivery can be trusted to overlook every step of your order so that we can guarantee the utmost satisfaction for our customers. Ellon florists can provide fantastic local delivery, as well as delivery for your Valentines gifts across the UK and even internationally. Our delivery in 140 countries across the world guarantees that even if you can’t be with your loved one this Valentine’s Day, Ellon flower delivery can ensure that your special someone knows that you’re thinking of them. Our team of florists in Ellon have over 40 years of experience in the floristry industry, which means that they are ready to help with any advice you may need concerning your special Valentines gift. There is no need to hesitate about getting in touch with our exceptionally friendly team about any queries you may have concerning your order. Here at Ellon Flowers our priority is ensuring both the customer and the recipient of our meaningful gifts are satisfied. We consider your order as exceptionally important, and will always treat it as such. This page of our site allows you to browse our great selection of Valentines gifts under £30 from Flowers Ellon. These gifts are both meaningful and affordable, which guarantees utmost satisfaction for you and your loved one this Valentine’s Day. Amongst our wonderful range of gifts we can offer a simple yet timeless ‘Single Kiss Rose vase’ with vase included, which is the perfect way to show your loved one just how much you care. Our Valentine’s Day gift bags and Valentine’s Tulip vase are also fantastic options for that special someone. Great prices and excellent quality mean that our team of florists in Ellon are confident that customers will be satisfied with our beautiful Valentines Gifts. Ellon Flowers also vary the gifts on offer to include heartfelt messages and champagne, meaning that you can easily add an extra touch to your wonderful gift. Valentine’s Day is all about showing those you love how much you care, and our range of beautiful and tasteful gifts mean that Ellon flower delivery can cater to this with ease. 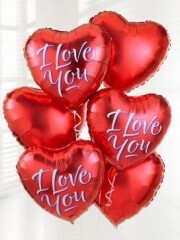 Our “I love you” balloon bouquet, which is composed of three plain balloons and three with “I love you” printed on them, is perfect to convey how much you appreciate your loved one. Ellon flower delivery can guarantee that a classic Valentines gift such as six ‘Crimson Kisses’ will be delivered safely and efficiently to your special someone wherever they may be. Ordering your Valentines gift from us ensures quality, as you can trust Ellon florists to make your Valentine’s Day an occasion to remember.